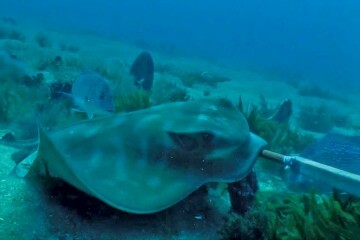 IMAGE: A fossil of an extinct ray. 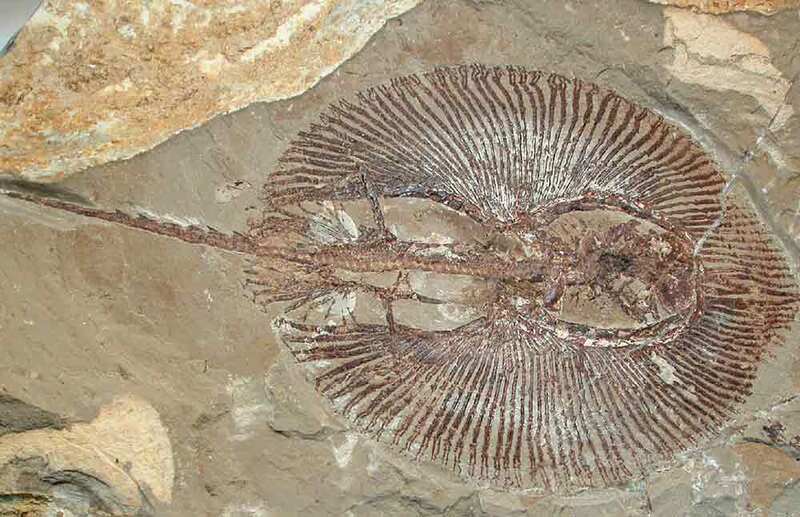 The maskrays originated after the collision of the Australian and Eurasian plates and their speciation may have been accelarated by falls in sea level millions of years ago. Image: John Adamek. An evolutionary understanding of Australia’s marine fauna can help to explain modern biogeographic patterns and assess the vulnerability-risk of fish families to present and future change. Historical climatic and geological processes, as the architects of evolutionary change, offer a means of predicting the environmental conditions that promote changes in distribution, extinction or persistence. 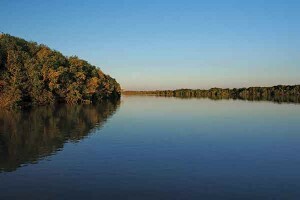 Because of its geological, climatic and geographic history, the Indo Australian Archipelago (IAA) is an ideal arena for examining the origins, speciation, diversification and colonisation of species across ecological climatic gradients, particularly in coastal habitats. 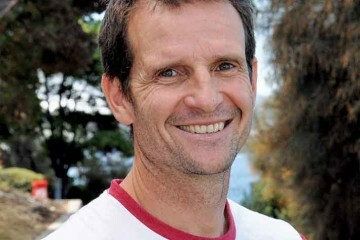 This project used selected fish families from the IAA and southern Australia to examine large-scale geological events or climatic changes that occurred millions of years ago, (such as the collision of the continents, or rising sea levels) for their influence on species creation and distribution. The findings highlight the origins of Australia’s endemic marine fauna and the role of the continent as a biodiversity reservoir, from geological periods to the present day. Specimens from the CSIRO Australian National Fish Collection were tissue-sampled for DNA extraction and sequencing to evaluate the genetic distances among species. Species evolution was placed into a timescale by calibrating the phylogenies with fossil records and a molecular clock to identify peaks of speciation or extinction. (The molecular clock hypothesis asserts that molecular sequences evolve at a relatively constant rate, so genetic differences between species can be related to the time since they last shared a common ancestor.) The resulting calibrated phylogeny is a reconstruction of the evolutionary history of each taxonomic group. 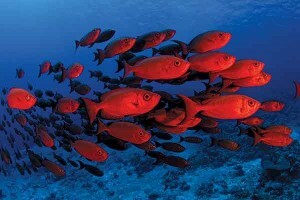 Additional evidence, such as species distributions and habitat associations, were used to identify functional shifts. The maskrays, genus Neotrygon (Dasyatidae), originated following the collision of the Australian and Eurasian plates, with the ancestral, narrow-ranging endemic species appearing Austral in origin. Evidence from the Neotrygon kuhlii species complex, the most derived and dispersed group of the genus, suggests that mid-Miocene (15.7 million years ago) and Plio-Pleistocene falls in sea level (2–5 million years ago) may have accelerated species formation. Genetically distinct lineages survived in isolated refugia following the geographic fragmentation of a once large, continuous population into distinct genetic variants of different colours. The tuskfishes, genus Choerodon (Labridae), diverged from their ancestral group, the Odacines, when extensive shallow water habitats formed at the onset of the Miocene (20 million years ago). 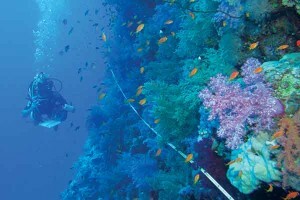 Today, the widespread species in the group occupy a broad range of habitat types, with peripheral endemics in specialised reef or non-reef habitats. Platycephalid flathead subfamilies Onigociinae and Platycephalinae diverged in the Eocene (35 million years ago) into mainly tropical and temperate species. Onigociins appear to have remained in the tropics and diversified since the early Miocene, while Platycephalins remained in temperate regions with only a few derived taxa reaching the tropics, possibly reaching the tropical Indo West Pacific from the Australian continent via tectonic rafting and shallow-water environments. Centrifugal speciation appears to have shaped diversity in both subfamilies across tropical regions. Southern Australian endemic fish in the family Labridae (genus Notolabrus) were estimated to have evolved six million years ago. Monacanthids (leatherjackets) diverged as early as 16 million years ago, possibly in parallel with Australian labrid taxa. On the other hand, the stingarees, genera Urolophus and Trygonoptera (family Urolophidae), began speciation in the late Oligocene (27 million years ago). Modern members of these groups, such as Urolophus bucculentus and U. flavomosaicus appeared as recently as two million years ago. Patterns of sympatric diversification (along latitudinal gradients) and parapatric speciation, (gradual speciation from populations with overlapping zones of contact), assisted by depth preferences, were common, suggesting local speciation supported by sea level fluctuations and habitat preference. Major geological events and the timing of diversification within the labridae, monacanthidae and urolophidae. ABOVE: Selected fish families from the Indo Australian Archipelago were used to examine large-scale geological events or climatic changes that occurred millions of years ago for their influence on species creation and distribution. 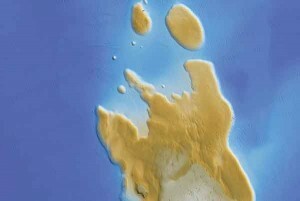 Image: Nikos Andreakis (plate tectonic evolution of the past 60 million years from Robert Hall, 2002). Glaciation cycles of the Pleistocene had important biotic consequences in temperate and tropical waters, causing range shifts, extinctions and the formation of unique endemic species. Sea-level fluctuations in the past two million years, however, have not significantly accelerated the evolution of groups such as the temperate wrasses and leatherjackets, and the stingarees. On the contrary, since diversification was static for the past two to three million years, it appears that extreme climatic events over geological time scales were necessary to achieve radical modifications in the distribution and composition of Australia’s unique fauna. 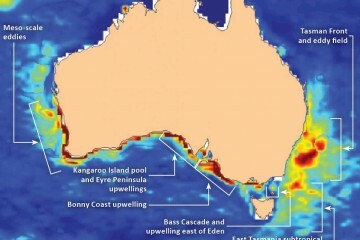 Under the present-day climatic scenario, range shifts have been detected for some Australian marine species, especially with the southwards penetration of boundary currents. 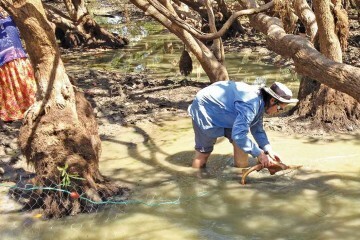 This could represent the beginning of rapid and drastic shifts in Australia’s marine biodiversity, however accurate estimates of the severity of climatic alterations necessary for new species to develop, or for existing species to vanish, cannot be realistically determined. The genealogical history in each of the analysed fish groups was influenced by multiple geological and climatic episodes. Each episode has left a distinct signature in the groups’ ecological function, morphology and genome. The patterns observed point to the integrative importance of environmental affinities, ecological conditions and biotic interactions in shaping modern biogeographic patterns. 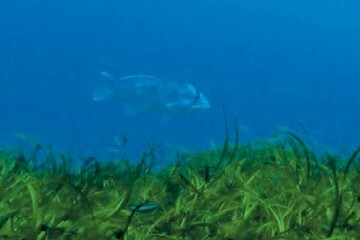 Synchronic speciation and the comparable biogeographic patterns in Australia’s wrasses, leatherjackets and stingarees demonstrate the evolutionary and tectonic stability of the Australian southern marine platform over geological times and the importance of Australia’s unique fish endemisms to the global marine diversity. 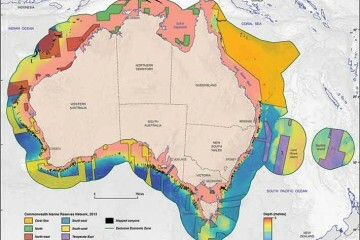 This project mapped the origins of selected Australian marine fauna, in particular its endemic species, providing knowledge that may help to guide realistic expectations for long-term sustainable management of Australia’s marine natural resources. The Australian continent emerged as a reservoir of biodiversity for the indo-Pacific in geological periods and as a Noah’s Ark’ for biodiversity in modern days. A conceptual framework and practical toolkit (molecular markers, genetic analysis protocols, biogeographic inference and modelling) has been created that is transferable to other marine groups.